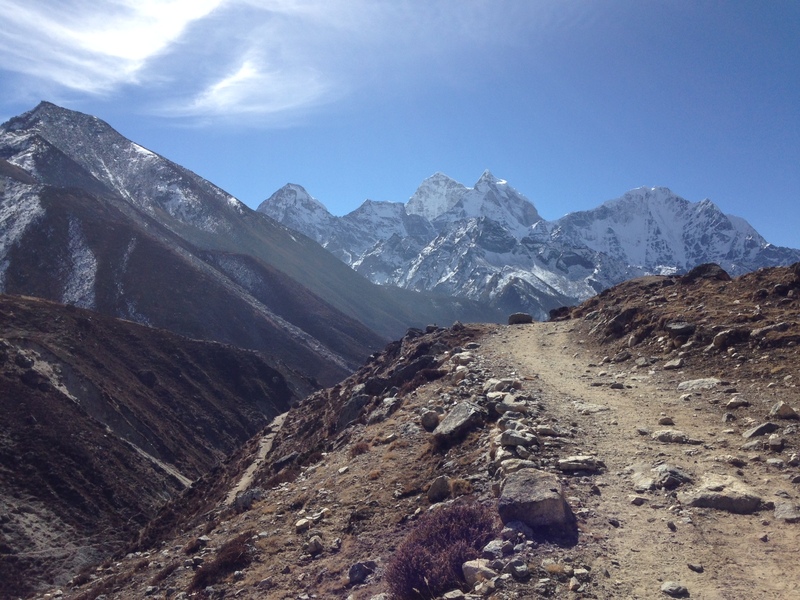 Today we hiked from Pangboche to Periche, only a 2 hour hike. Yesterday we hiked about 5 hours down to the valley floor, crossed the river, and then came back up, gaining only 200 m net elevation. From now on we’re going up so taking care to build in a little rest time. The plan is to acclimatize here in Pheriche (4240m) overnight then hike up to Pyramid (4970 m), the worlds highest meteorological station (I think). Well spend two nights there acclimatizing and then head to the Changri Nup base camp and start the data collection! For reference, here’s the last part of our trek in. 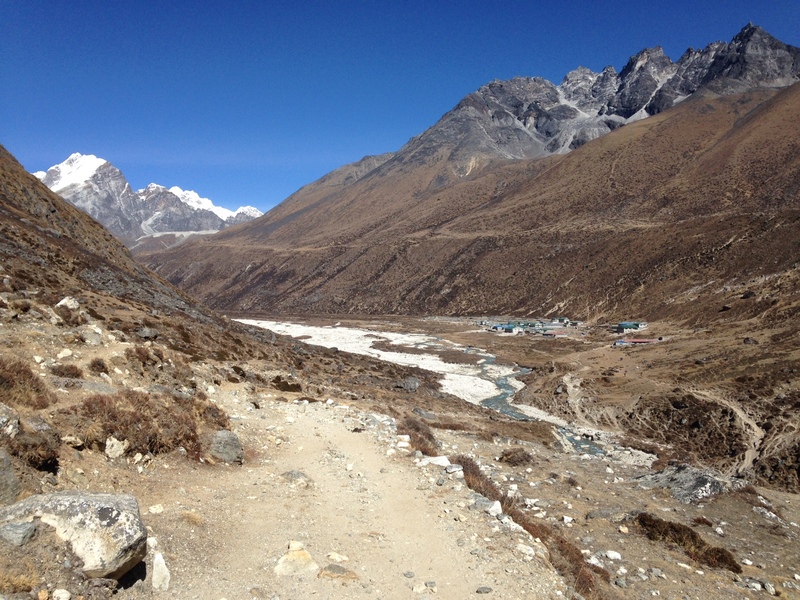 You can see Khumjung where we were 2 nights ago, Pangboche where we were last night, and Pheriche where I’m writing from. Pyramid Station is also labeled, near the ring finger in this pic. Yesterday on the trail I saw one of my boxes of scientific gear go by! This box contains a 400 MHz ground penetrating radar as well as a few other instruments. Masters student Josh Maurer is on the left. I’ve been enjoying the hike in (very different from taking a plane or helicopter to my field sites) and am looking forward to our day at Pyramid when we’ll be programming temperature sensors, etc. for the field. 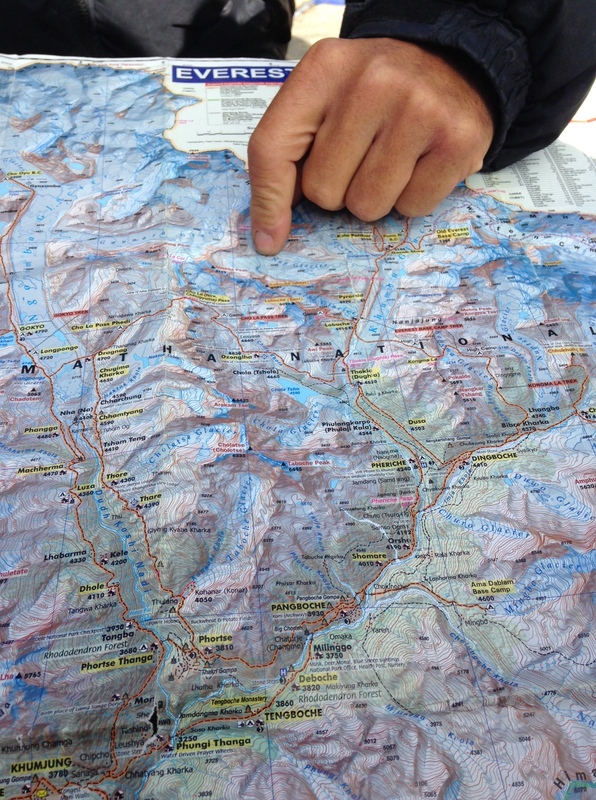 Prof. Mike Dorais (BYU geology prof) has been teaching us about the geology along the way. The first night we all sat around a geologic map of Nepal and learned about how the Himalayas formed (and why there’s a yellow stripe of sedimentary rock at the top of Everest!). And he’s pointed out a few neat rocks along the trail. 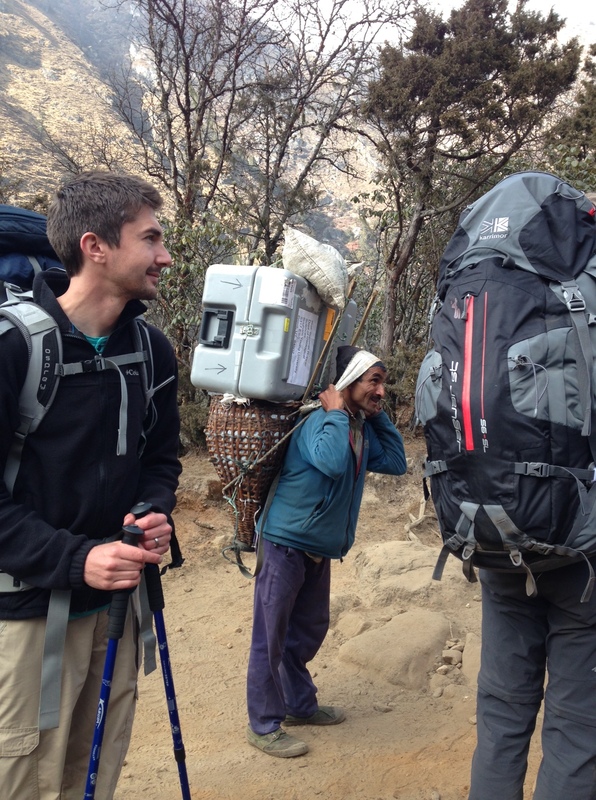 I’ve enjoyed hiking and socializing with such accomplished scientists on the trek in and have been having very enlightening conversations about the importance of collaboration in science, why different people chose careers in glaciology, what the other grad students see as being next for them, etc. Thanks for reading! Will update again when possible!